Anew Platinum Define & Contour Day Cream SPF 25 UVA/UVB helps to avoid sagging skin and restores a distinct oval face. Thanks to reflective microparticles skin is instantly brightened. Prolonged use makes skin more resilient and firm. Dermatologically tested. 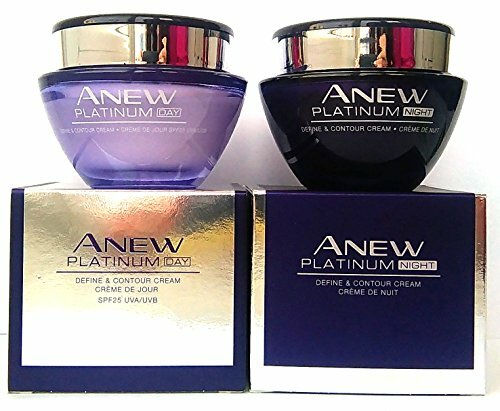 Night Cream 55+ 50ml - 1.7oz Anew Platinum Define & Contour Night Cream owing to a silky texture gives the skin a feeling of comfort and helps give it a surprising softness and smoothness. As many as 80% of women said that the skin of the neck looks much more tense. After 2 weeks the contours of your neck and jaw seem to be more expressive; wrinkles are less visible. After 4 weeks, the skin on the cheeks looks tighter. Clinical studies have shown that the use of night cream with serum, increases the softness of the skin by more than 40%.